!! OMG, the gay Mardi Gras trinity: Andy, ACoop, and the BF !! 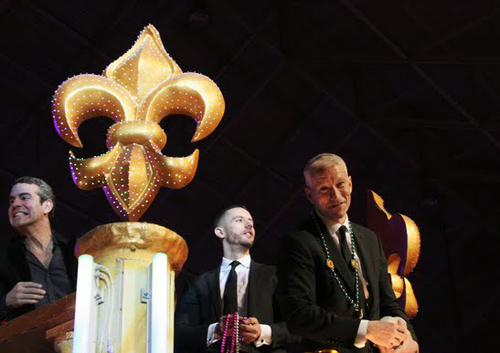 This photo of New Orleans Mardi Gras Grand Master Anderson Cooper with boyfriend Benjamin Maisani and Bravo Emperor Andy Cohen would be oh-so-much better if someone were showing a little nip — although Andy’s hard grin makes me think he’s seeing much, much more off-frame. 5 Comments on "OMG, the gay Mardi Gras trinity: Andy, ACoop, and the BF"
Okay, wait. Anderson Cooper was on top of the Grand Marshal float for Endymion with Kelly Ripa and Mark Consuelos. It looks like Andy Cohen and Benjamin Maisani got on once the float got to the Endymion Extravaganza after the parade. And not to be a bummer, but no one flashes at Mardi Gras. That’s something drunk tourists do on Bourbon Street, where there are no parades. I wish AC would just come out already and just admit what the world already knows. He is so incredibly handsome and charming, I just wish all my late night fantasies could be made legit. That said, I understand how he doesn’t want to *be* the news, and rather just report it. However, with successful anchors like Rachael Maddow and Thomas Roberts heading high visibility stations, I really don’t think it’d be that big a deal. Speaking of Thomas Roberts…if he and Anderson…I’ll keep dreaming. When did Anderson Cooper come out? So is that really the bf? Or is that who we hope is the bf? Has Anderson actually come out yet? ?